It’s worth noting that peacekeeping missions and mandates must be unanimously approved by all permanent members of the Security Council, including the U.S. and Russia, a constraint that has prevented UN intervention in some conflict zones. But this wasn’t always the case: In the mid-1990s, when the Balkan states of Europe were riddled with violence and UN peacekeepers were active in the area, European nations – particularly the UK and France – made up the largest shares of total contributions. In September 2015, President Barack Obama presided over a UN peacekeeping summit, acknowledging that the “supply of well-trained, well-equipped peacekeepers can’t keep up with the growing demand” and promising renewed support for peace operations, mostly in the form of military experts, training and resources. The United States’ contributions of UN forces peaked at 4,200 in October 1993, the month of the “Black Hawk Down” firefight in Somalia that left 18 Americans dead. (It was part of a separate U.S.-led mission but was related to UN goals.) 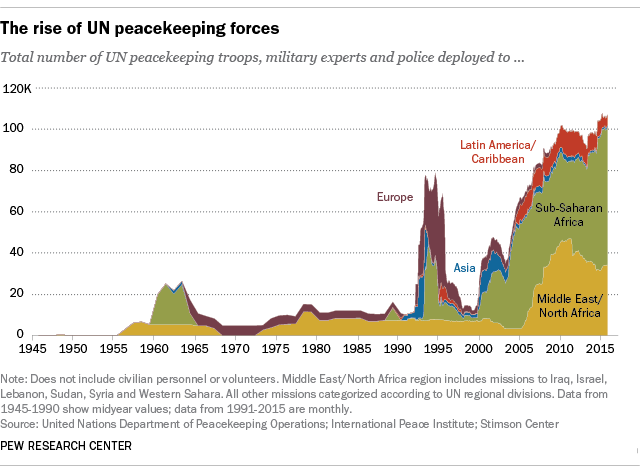 At the time, the U.S. was the fourth-largest contributor of peacekeepers, making up 5.6% of the total UN force. But political and public pressure following the Somalia fiasco led the U.S. to withdraw its forces from the region in general, and the U.S.’s overall contributions have steadily dwindled since. Today, a record low share of UN peacekeepers are from the U.S. (just 76 personnel, or 0.07%). However, the U.S. finances UN peacekeeping more than any other country (it’s charged with 28% of the total budget) – in accordance to a formula that apportions expenses based on the relative wealth of each country, among other factors. Japan (10.8%), France (7.2%), Germany (7.1%) and the UK (6.7%) are the other top contributors of funds. 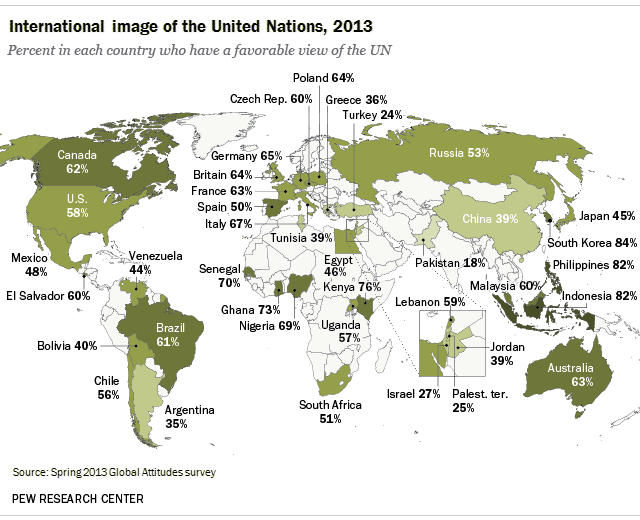 As recently as 2013, the UN maintained a strong international image: A global median of 58% across 39 countries saw the UN favorably, compared with a median of 27% who viewed it unfavorably, according to a Pew Research Center survey. UN support was highest in the Asia-Pacific and lowest in the Middle East. It was also generally liked in Europe, Africa and Latin America.